Signed and Dedicated Books - GREAT GIFTS! Here are Jack Trelawny's books. Choose the items you would like to purchase by using the 'Add to Cart' buttons. Then click the 'View Cart' button below to manage your shopping cart and proceed to checkout. All books ordered from this website are signed by the author and can be dedicated (e.g. 'To Lucy, Happy 9th Birthday!') 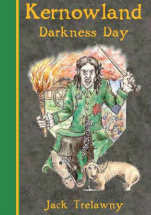 by the author if the required dedication is entered in the relevant box above the 'Add to Cart' button for each book. 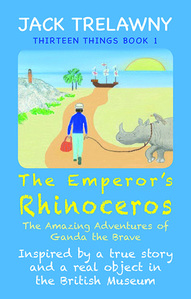 Ganda is a happy young rhinoceros living on the Plains of India. One day, he and his mother visit the watering hole. Ferocious hunters attack. Stolen and chained, Ganda begins an incredible journey: from Asia to Africa to Europe. 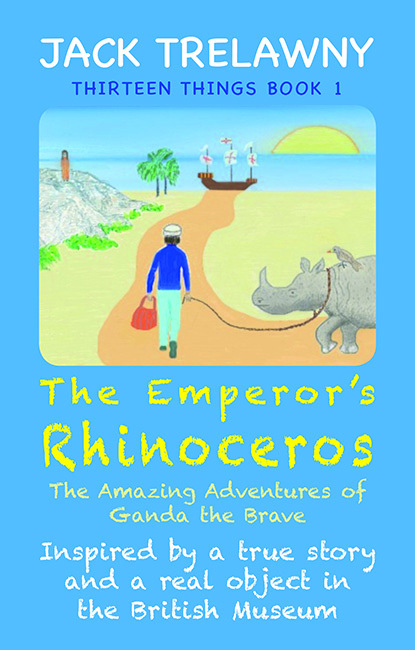 Can the heroes - Ganda, Akeem the apprentice zookeeper, Princess Aisha of Gujarat, and Tikki the clever tickbird - foil the plans of Raja Kadar, the tyrant of Rajasthan? Thirteen Things is a series of 13 stories inspired by the joint British Museum and BBC Project: A History of the World in 100 Objects. Jack is visiting schools to show children how he turns the TRUE STORIES of the real objects into fiction. Tizzie and Louis are on holiday in Cornwall when they enter Echo Cave and are transported through the Crystal Pool to the amazing and mysterious Kingdom of Kernowland in Erthwurld. Now, before he can go home, the young boy has to rescue his sister. Will he be able to find and rescue Tizzie before she is sold on by the pirates and lost forever in Erthwurld? Tizzie, Louis, and Misty the little blue mouse, were left in dire straits at the end of Book 1. In Book 2, we find out which of them survives. 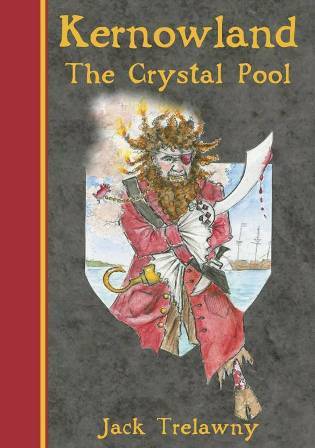 We meet more of the gruesome characters in Kernowland, like Wendron the wrinkled witch and Warleggan the warty warlock, as well as old favourites like the fearsome Cap’n Pigleg, the scowling Sheviok Scurvy, and the nasty Melanchol Drym, who appears on the front cover, with his sharp stick, 'Spikey'. The invasion of evil has begun, and the Ramdragons of Selaw have set Kernowland ablaze in a surprise air attack. Now the vast armies of Evile's Empire are massing on the borders. The Kernowfolk will fight bravely. But in the face of such overwhelming odds, resistance seems futile. 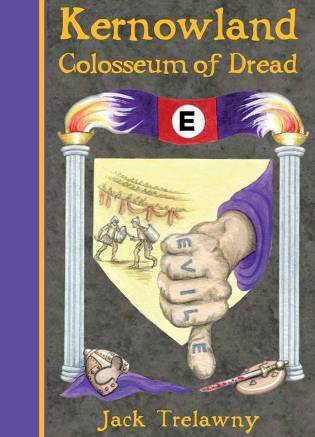 Will Evile conquer Kernowland and so bring Darkness upon the whole of Erthwurld? Tizzie was in big trouble at the end of Book 3. Held captive on a pirate ship, The Revenger, she was sailing for Jungleland to become live bait for Big Red Grunter, the mutant wild boar that took Cap’n Pigleg’s left leg. Louis was in Sandland, racing to rescue Tizzie with Akbar and Hans. The other rescuers, Princess Kea, Mr Sand, Clevercloggs, and Misty the little blue mouse, were just leaving Kernowland for Jungleland through the Crystal Door. Can the rescuers save Tizzie from the hungry boarmonsters in time… ? 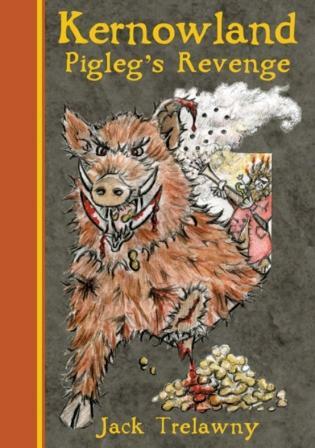 With a reward of five thousand evos on his head, Louis was snatched by Captain Pigleg in Jungleland at the end of Book 4. Here in Book 5, he’ll be taken back to face the grizzly Guillotine of Sirap. Tizzie was caught in the armtentacles of a giant tree octopus, and the mutant monster was about to eat her with its sharp beak. 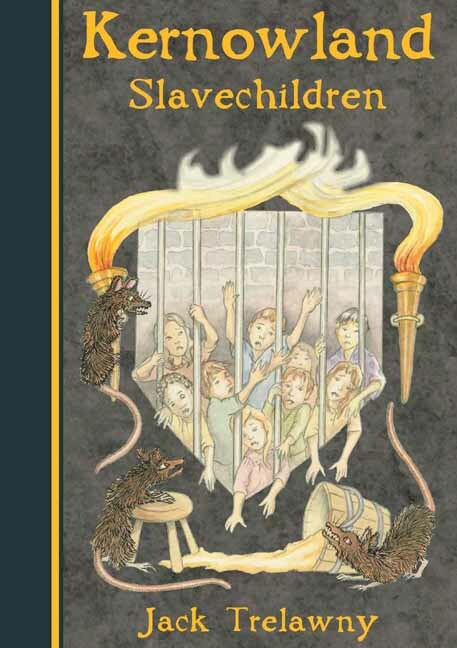 Meanwhile, back in conquered Kernowland – which has been renamed ‘Wonrekland’ – Drym has a new ‘pet’, a fearsome wolfspider called Danglefang, and parents everywhere are agonising over Lister’s Choice… which one of their precious children will they deliver into slavery? Louis is a condemned prisoner as Evile and his loathsome cronies arrive in the newly named, “Wonrekland”. The terrified young boy knows he has been matched against the Evil Emperor’s giant Champion Gladiator, Og the Ogreman, in the Colosseum of Dread. He now has to meet Og and his mighty Ironhammer in mortal combat. As the Great Battle between Darkness and Light looms ever closer, will Tizzie and the other Questers be successful in their search around Erthwurld for the Eight Crystals of the Amulet of Hope? And will Tizzie and Louis ever be reunited? Find out in this exciting conclusion to the Kernowland story….